Well, here we are friends. Already 3 weeks into the new year and life is in full swing. Like I said in my previous post, I don't typically do resolutions. But I do reset and look towards being better than the year before. One of my goals in the past couple of years is to be more "eco-friendly" every year. I feel I made good progress last year and I want to make more this year! Want to join me?? 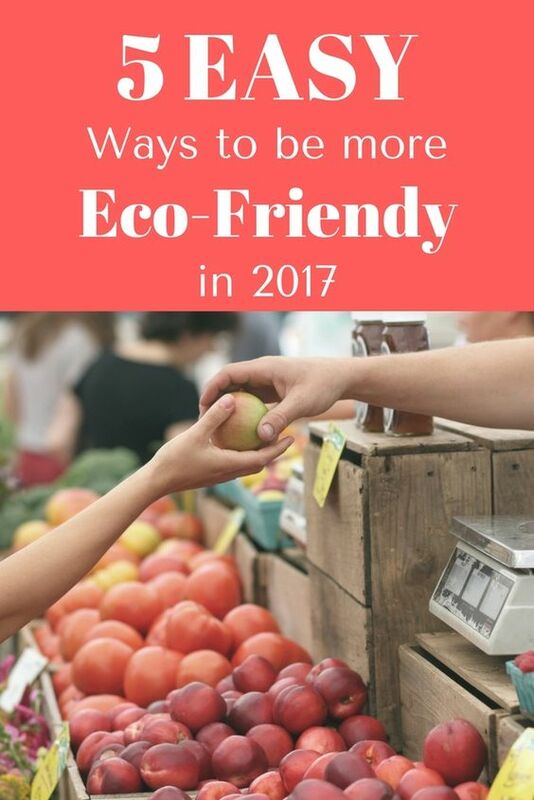 Here are 5 EASY ways to be more eco-friendly in 2017! I've written about the benefits of glass before (click the photo to the post). But really its the best way to not only be eco-friendly but also get ugly BPA's and chemicals off and out of your body. Some easy ways to switch to glass is to use Mason Jars (such as Ball Canning) for drinking and storage. They are inexpensive for a set and can be used for many purposes. Also, keep an eye out for good glass pyrex sets. You can find good deals at stores like TJ Maxx and Big Lots. Don't forget about amazon too! This is a no brainer. But it isn't hard and is the best way to always be eco-friendly. We have a say in what get's made and what is put on the grocery store shelves by what we buy. Next time you buy that conventional bag of rice. Look around, is there a better choice? Maybe an organic or non-gmo label is being hidden beneath the other products on the shelves. Stores get new products all the time, so keep an eye out and make the better/healthier choice! Next, is start swapping out old non-stick pans for ceramic. I got a set from my wonderful aunt for christmas. I LOVE them. So easy to clean and I know their aren't any harsh chemicals coming from the pans when I cook. 5. Check your beauty cabinet, and while your at it, check your cleaning cabinet too! Now this is one I am constantly working on. But take a look in your cabinets. Put your products into EWG database, are they really eco-friendly and good for you?? How are you being more eco-friendly this year! I'd love to hear your thoughts! I think I follow most of these tips already, great to know I'm doing OK. Thanks for writing such a useful post for those that don't!